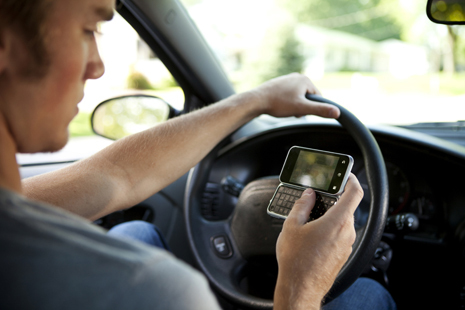 Cell-phone use in dangerous situations, such as while driving, may be attributed to obsessive-compulsive disorder traits rather than addiction. FAYETTEVILLE, Ark. – Information researchers at the University of Arkansas have found evidence that suggests dangerous mobile phone usage while driving may be attributed to obsessive-compulsive disorder traits rather than addiction. The findings have significant policy implications because most legislation prohibiting mobile phone usage while driving – which generally has failed – has relied on research that links dangerous and excessive usage to addictive traits. In 2010, the National Safety Council estimated that the cause of approximately 28 percent of all vehicle accidents – a total of 1.6 million annually – could be attributed to mobile phone usage. Recent legislation, based on addiction or dependence models of treatment, has banned usage while driving or attempted to discourage dangerous and inappropriate usage by punishing drivers caught in the act. Yet, according to the Highway Loss Data Institute, mobile-phone-related accidents have actually increased in many areas since the passage of these laws. Despite these health and legal risks, people appear likely to continue using mobile phones while driving. Through an online survey website, Limayem and a doctoral student, Zach Steelman, collected data from 451 men and women of various age groups and locations. The survey did not restrict the sample pool by demographics but did require that all respondents own a cell phone. Internet provider addresses and email addresses were traced to eliminate multiple responses. The average age of participants was 28, and two-thirds (66.3 percent) of the respondents were men. Of all participants, 80 percent had a bachelor’s degree or higher, 75 percent were employed and 57 percent were single. More than half – 57.6 percent – of the participants used a smartphone. — I answer calls/emails/text messages while driving. — I make calls and send emails and text messages while driving. — I browse the Internet while driving. — I check social network applications while driving. Among other questions, the respondents were asked how many years they had owned a cell phone, and how many hours they spent per day talking, emailing and texting on their phone. Consistent with studies on obsessive-compulsive disorder, Limayem and Steelman made several predictions related to behavior and mobile phone usage. First, however, they discussed the cultural impact of cell phones, specifically how they have blurred boundaries between work and family, and how users have allowed the devices to alter their perceived responsibility toward both. They theorized that this perceived increase in responsibility would have a greater impact on compulsive mobile phone usage. In other words, because people now have a tool that allows them to receive work messages at home and family messages at work, they perceive the importance of each as greater. This perception, in turn, increases compulsive checking. The findings confirmed these predictions. Perceived work demand and perceived family demand were significant predictors of individually perceived – and inflated – responsibilities. This perceived increase in responsibility had a positive impact on compulsive usage. Ultimately Limayem and Steelman found a significant link between compulsive usage and dangerous usage. “Evidence of compulsive behavior brings to light the notion that the underlying motivation to use a mobile phone is not pleasure, as predicted by addictions studies, but rather a response to heightened stress and anxiety,” Limayem said. Not surprisingly, the findings showed that the most significant predictor of dangerous mobile phone usage was answering text messages while driving. Incoming alerts triggered dangerous usage. Conversely, initiating text messages was not a significant factor. “Dangerous usage thus appears to represent a reaction to incoming alerts, not a need to initiate more conversations, as predicted by an addiction model,” Limayem said. They emphasized that legislative bans on excessive and dangerous mobile phone usage likely will have no impact on users who exhibit obsessive-compulsive tendencies. Adjusting perceived responsibility levels to match a more realistic view of reality – that is, convincing people of the potential cost versus small benefit or responding instantly – could mitigate compulsive use and decrease the number of vehicle accidents, Limayem said. But achieving this might be difficult. Limayem suggested that public-service announcements and other similar informative interventions might be more successful measures than punitive actions. From a purely technological perspective, creating different ring tones or alerts corresponding to different “networks” (work, family, friends) or importance levels could alter stimuli produced by mobile phones and thus reduce compulsive use. Limayem is holder of the Edwin and Karlee Bradberry Chair in Information Systems.